"M134" redirects here. For the highway, see M-134 (Michigan highway). It has been suggested that Dillon Aero be merged into this article. (Discuss) Proposed since July 2013. Dillon Aero's M134D-H (H for Hybrid) combines the titanium and skeletonized parts that were engineered for use in the M134D-T minigun with the steel housing of the previous M134D. The M134 Minigun is a 7.62x51 mm NATO, six-barreled rotary machine gun with a high rate of fire (2,000 to 6,000 rounds per minute). It features Gatling-style rotating barrels with an external power source, normally an electric motor. The "Mini" of the name is in comparison to designs that use a similar firing mechanism, such as General Electric's earlier 20 mm M61 Vulcan, and "gun" referencing the delineation between rifle caliber bullets and the shells fired by autocannons. "Minigun" refers to a specific model of weapon that General Electric originally produced, but the term "minigun" has popularly come to refer to any externally powered Gatling-style or rotary gun of rifle caliber. The term is also used to refer to guns of similar rates of fire and configuration regardless of power source and caliber. The ancestor to the modern minigun was made in the 1860s. Richard Jordan Gatling replaced the hand cranked mechanism of a rifle-caliber Gatling gun with an electric motor, a relatively new invention at the time. Even after Gatling slowed down the mechanism, the new electric-powered Gatling gun had a theoretical rate of fire of 3,000 rounds per minute, roughly three times the rate of a typical modern, single-barreled machine gun. Gatling's electric-powered design received U.S. Patent #502,185 on July 25, 1893. Despite Gatling's improvements, the Gatling gun fell into disuse after cheaper, lighter-weight, recoil and gas operated machine guns were invented; Gatling himself went bankrupt. During World War I, several German companies were working on externally powered guns for use in aircraft. Of those, the best-known today is perhaps the Fokker-Leimberger, an externally powered 12 barrel Gatling gun in the 7.92x57mm Mauser round, claimed to be capable of firing over 7,000 rpm, but suffering from frequent cartridge-case ruptures due to its "nutcracker", rotary split-breech design, which is fairly different from that of a Gatling. None of these German guns went into production during the war, although a competing Siemens prototype (possibly using a different action) which was tried on the Western Front scored a victory in aerial combat. The British also experimented with this type of split-breech during the 1950s, but they were also unsuccessful. In the 1960s, the United States Armed Forces began exploring modern variants of the electric-powered, rotating barrel Gatling gun-style weapons for use in the Vietnam War. American forces in the Vietnam War, which used helicopters as one of the primary means of transporting soldiers and equipment through the dense jungle, found that the thin-skinned helicopters were very vulnerable to small arms fire and rocket-propelled grenade (RPG) attacks when they slowed down to land. Although helicopters had mounted single-barrel machine guns, using them to repel attackers hidden in the dense jungle foliage often led to barrels overheating or cartridge jams. 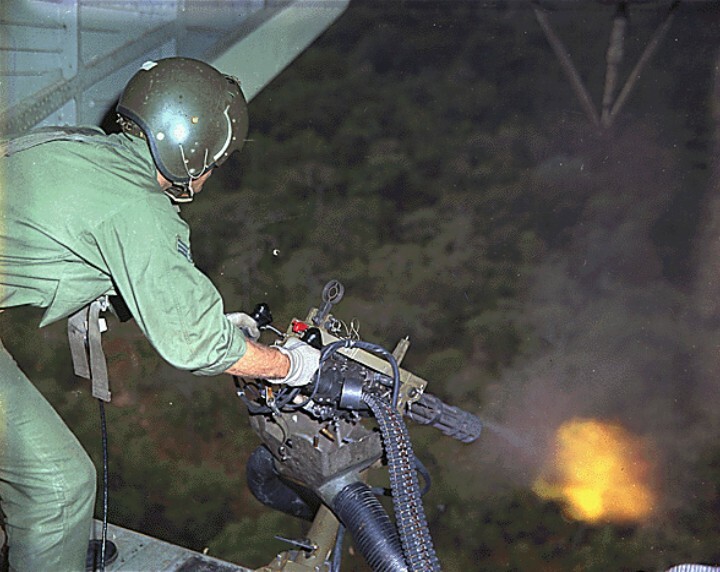 A U.S. Air Force rotary-wing crewman fires a minigun during the Vietnam War. In order to develop a weapon with a more reliable, higher rate of fire, General Electric designers scaled down the rotating-barrel 20 mm M61 Vulcan cannon for 7.62×51 mm NATO ammunition. The resulting weapon, designated M134 and known popularly as the Minigun, could fire up to 4,000 rounds per minute without overheating. The gun was originally specified to fire at 6,000 rpm, but this was later lowered to 4,000 rpm. The Minigun was mounted on OH-6 Cayuse and OH-58 Kiowa side pods, in the turret and wing pods on AH-1 Cobra attack helicopters, on door, pylon and pod mounts on UH-1 "Huey" Iroquois transport helicopters. Several larger aircraft were outfitted with miniguns specifically for close air support: the A-37 Dragonfly with an internal gun and with pods on wing hardpoints, and the A-1 Skyraider also with pods on wing hardpoints. Other famous gunship airplanes were the AC-47 Spooky, the AC-119 gunship, and the AC-130 gunship. Garwood Industries of Scottsdale Arizona is a certified government contractor specializing in the design and manufacture of Miniguns. They have been studying the Minigun design for some time and have developed their latest project, the M-134G, which incorporates several upgrades to the original G.E. system designed over 40 years ago. Through their extensive research they have discovered that the highest rate of fire the system is possible of operating at may not be the optimum rate of fire for hit potential. After several extended firing exercises, Garwood collected enough data to conclude that the optimum rate of fire for the Minigun system is approximately 3,200 rounds per minute (rpm). This cyclic rate provides the operator with the maximum amount of target saturation while expending a minimum amount of ammunition. Even a novice gunner can achieve a greater rate of accuracy at the 3,200 rpm mark. Because of these findings the M-134G is being produced and offered with this firing rate as well as 4,000 rpm and the previous standard of 3,000 rpm. While the rate of fire research and adjustments have been quite significant, several other upgrades and improvements have been implemented by Garwood Industries, and for the first time since General Electric manufactured Miniguns in the 1960s, the complete M-134G system is being manufactured to meet and exceed military requirements. To accomplish this, all of the weapons components adhere to ISO standards to ensure quality traceability. Drive Motor – Many positive improvements to the tried and true General Electric drive motor have been implemented using products not previously available. These improvements allow the motor to be lighter and extend the service life at the same time. Since the beginning of the M-134G project, three proactive upgrades have been accomplished and even the solenoid has been revised several times. Gun Control Unit – Garwood Industries has upgraded the gun control unit using state-of-the-art electronics to guarantee unsurpassed reliability not previously thought possible. A manual override for the booster assembly is standard on all M134G models. Feeder/Delinker – The Garwood feeder/delinker has an upgraded cartridge handoff system and has been finished with a new high-performance coating that will increase longevity and enhance operation in all environments. The Barrel Clutch Assembly - Clamp/Flash – The barrel clutch assembly has been re-engineered to both lighten the weapon system and improve performance. The newly designed flash suppressor completely eliminates the blinding flash that was a constant problem with older Minigun systems. New designs are being tested to even inhibit the sparks that are created from unburned powder and it is expected to completely eliminate the visual signature under fire. Bolts – A new government model is being finalized that utilizes a new proprietary bolt design. The material and coatings used in this latest system greatly improve the longevity of the system and exceed current specifications. Grip Assembly – The M-134G spade grip assembly is integral with the receiver through a new proprietary mounting lug. Previous versions only mounted to the clutch or other components. The new mounting area greatly improves the rigidity of the system. Rail System – The M-134G incorporates a rail system that allows the easy mounting of several accessories that may be found useful to its operator. These include, but are not limited to, scopes, electronic sights, lasers and spot lights. The U.S. Government had procured some 10,000 miniguns during the Vietnam War. By 1975, production of support parts had ceased with the Army in possession of such a large inventory. By 1985, there were few spares left in the inventory. Units that received them could not maintain them, so by the 1990s only Task Force 160 and some Navy Special Boat Units kept them in regular use. Around 1995, TF 160 began acquiring spare miniguns solicited by TACOM. Industry had a difficult time reproducing parts according to the original blueprints, so models that were being procured were mechanically unreliable and mixed with the inventory of working spares. This resulted in using a mixed batch of working and unreliable weapons. This fact was unknown to the 160th SOAR, and the use of miniguns that would not work shook their confidence in the system. The 160th were on the verge of dropping it from their inventory entirely, which would essentially have ended its service life in the U.S. Military. Around 1990, Dillon Aero acquired a large number of miniguns and spares from "a foreign user." The guns kept failing to shoot continuously, revealing that they were actually worn-out weapons. The company decided to fix the problems they encountered, rather than simply putting them into storage. Fixing failure problems ended up improving the minigun's overall design. Dillon's efforts to improve the minigun reached TF 160, and they were invited to Fort Campbell, Kentucky to demonstrate their products. A delinker, used to separate cartridges from ammunition belts and feed them into the gun housing, and other parts were fired on Campbell test ranges. The 160th SOAR liked the delinker's performance and began ordering them by 1997. This prompted Dillon to improve other design aspects, including the bolt, housing, and barrel. From 1997-2001, Dillon Aero was producing 25-30 products a year. In Fall 2001, they were working on a new bolt design that increased performance and service life, when the September 11th attacks occurred. By 2002, virtually every component of the minigun had been improved, so Dillon began producing entire weapons with their improved components. The guns were purchased quickly by the 160th Regiment as their standardized weapon system. TACOM bought several guns to go through their approval process and in 2003 the Dillon Aero minigun was certified and designated as the M134D. The core of the M134D was a steel housing and steel rotor. To focus on weight reduction, a titanium housing and rotor were introduced, creating the M134D-T. This reduced weight from 62 lb to 41 lb. The gun housing had a 500,000 round lifespan before it wore out, which was higher than a conventional machine gun's 40,000 round lifespan but was a reduced time for a rotary gun. A hybrid of the two weapons resulted in the M134D-H, which had a steel housing and titanium rotor. It was cheaper with the steel component, was only 1 pound heavier than the M134D-T, and had an increased lifespan of 1.5 million rounds. The M134D-H is currently in use on various 160th Regiment platforms. Dillon has put considerable work into creating specialized mounts and ammunition-handling systems. Initially, mounts were only made for aviation systems. Then from 2003–05, the Navy began mounting Dillon miniguns on specialized small boats. In 2005, the Naval Surface Warfare Center Crane Division procured guns to mount on Humvees. Army Special Forces on the ground in Iraq were being engaged daily, so they mounted M134Ds on vehicles. When attackers ambushed, they were hammered by the miniguns and quickly broke off the attack. Radio chatter from the enemy showed they were confused about this new weapon and told not to attack. Soon after the group equipped with Dillon miniguns were not being engaged, while other units still were. They took to concealing their new weapons to trick the enemy since they were not in the fight because the enemy was too afraid to confront the minigun and would not attack. As a further testament to the minigun's psychological effect, regular Army units began painting and tying together six sections of PVC pipe to make insurgents think they were armed with it to dissuade them from attacking. The basic minigun is a six-barrel, air-cooled, and electrically driven rotary machine gun. The electric drive rotates the weapon within its housing, with a rotating firing pin assembly and rotary chamber. The minigun's multi-barrel design helps prevent overheating, but also serves other functions. Multiple barrels allow for a greater capacity for a high firing rate, since the serial process of firing/extraction/loading is taking place in all barrels simultaneously. Thus, as one barrel fires, two others are in different stages of shell extraction and another three are being loaded. The minigun is composed of multiple closed-bolt rifle barrels arranged in a circular housing. The barrels are rotated by an external power source, usually electric, pneumatic, or hydraulic. Other rotating-barrel cannons are powered by the gas pressure or recoil energy of fired cartridges. A gas-operated variant, designated the XM133, was also developed. It is near identical but has barrels with ports that align with the piston drive in the center of the barrel cluster. It fired over 3000 rpm but was not put into production. While the weapon can feed from linked ammunition, it requires a delinking feeder to strip the links as the rounds are introduced to the chambers. The original unit was designated MAU-56/A, but has since been replaced by an improved MAU-201/A unit. The General Electric minigun is in use in several branches of the U.S. military, under a number of designations. The basic fixed armament version was given the designation M134 by the U.S. Army, while exactly the same weapon was designated GAU-2/A by the U.S. Air Force. The USAF minigun variant has three versions, while the U.S. Army weapon appears to have incorporated several improvements without a change in designation. Available sources show a relation between both M134 and GAU-2/A and M134 and GAU-2B/A. A separate variant, designated XM196, with an added ejection sprocket was developed specifically for the XM53 Armament Subsystem on the AH-56 Cheyenne helicopter. Another variant was developed by the U.S. Air Force specifically for flexible installations, beginning primarily with the UH-1N helicopter, as the GAU-17/A. The primary end users of the GAU-17/A have been the U.S. Navy and the U.S. Marine Corps, which mount them as defensive armament on a number of helicopters and surface ships. The weapon is part of both the A/A49E-11 armament system on the UH-1N and A/A49E-13 armament subsystem on the HH-60H aircraft. The weapons on these systems feature a selectable fire rate of either 2,000 or 4,000 rpm. There is mention of a possible GAUSE-17 designation (GAU-Shipboard Equipment-17), in reference to the system when mounted on surface ships, though this would not follow the official ASETDS designation system's format. Other manufacturers in the United States produce Miniguns with various refinements of their own, including Garwood Industries (M134G). and Dillon Aerospace (M134D). The minigun is designated M134 in U.S. Army service. In the Navy and Air Force, it is designated GAU-2/A on a fixed mount and GAU-17/A on a flexible mount. N/A GAU-17/A N/A GAU-2B/A variant; optimized for flexible use, uses either an MAU-201/A or MAU-56/A delinking feeder. XM214 Microgun N/A N/A Scaled-down variant of the XM134 firing the 5.56mmx45mm NATO round. One of the first applications of the weapon was in aircraft armament pods. These gun pods were used by a wide variety of fixed and rotary wing aircraft mainly during the Vietnam War, remaining in inventory for a period afterward. The standard pod, designated SUU-11/A by the Air Force and M18 by the U.S. Army, was a relatively simple unit, completely self-contained, with a 1,500 round magazine directly feeding delinked ammo into the weapon. This means the Minigun fitted to the pod does not require the standard MAU-56/A delinking feeder unit. A number of variations of this pod exist. Initially on fixed-wing gunships, such as the AC-47 and AC-119 the side-firing armament was fitted by combining SUU-11/A aircraft pods, often with their aerodynamic front fairings removed, with a locally fabricated mount. These pods were essentially unmodified, required no external power, and were linked to the aircraft's fire controls. The need for those pods for other missions led to the development and fielding of a purpose built "Minigun module" for gunship use, designated the MXU-470/A. These units first arrived in January 1967 with features such as an improved 2,000 round drum and electric feeder allowing simplified reloading in flight. The initial units were unreliable and were withdrawn almost immediately. By the end of the year, however, the difficulties had been worked out and the units were again being fitted to AC-47s, AC-119s, AC-130s, and even being proposed for lighter aircraft such as the O-2 Skymaster. A fit of two MXU-470/As was also tested on the AU-23A Peacemaker, though the Royal Thai Air Force later elected to use the other configuration with the M197 20 mm cannon. In September 2013, Dillon Aero came out with the DGP2300 gun pod for the M134D-H. It contains 3,000 rounds, enough ammunition to fire the minigun for a full minute. The system is entirely self-contained, so it can be mounted on any aircraft that can handle the weight, rotational torque, and recoil force (190 lb (86 kg)) of the gun. The pod has its own battery which can be wired into the aircraft to start a charge. Various iterations of the minigun have also been used in a number of armament subsystems for helicopters, with most of these subsystems being created by the United States. The first systems utilized the weapon in a forward firing role, for a variety of helicopters, some of the most prominent examples being the M21 armament subsystem for the UH-1 Iroquois and the M27 for the OH-6 Cayuse. It also formed the primary turret mounted armament for a number of members of the AH-1 Cobra family. The weapon was also used as a pintle-mounted door gun on a wide variety of transport helicopters, a role it continues to serve in today. Neal MG, a 5 barrel .22LR self operated weapon. XM133, a gas operated variant. EX-17 Heligun, a self operated rival to the M134. Bangerter machine gun, a 12 barrel self operated weapon. Slostin machine gun, a self operated weapon of Soviet origin. GShG-7.62, Russian equivalent to the M134. CS/LM12, Chinese equivalent to the M134. ↑ "U.S. Patent 502185 Gatling Gun". http://www.scribd.com/doc/14173249/US-Patent-502185-Gatling-Gun. Retrieved February 4, 2010. ↑ C. J. Chivers (2010). The Gun. Simon & Schuster. pp. 116–119. ISBN 978-1-4391-9653-3. ↑ 3.0 3.1 Motor Guns-A flashback to 1914–18. Flight, 8 March 1957, pp. 313–314. ↑ Anthony G. Williams; Emmanuel Gustin (2005). Flying Guns of the Modern Era. Crowood. p. 55. ISBN 978-1-86126-655-2. ↑ United States, 1969. p. C-31. ↑ U.S. ARMY HELICOPTER WEAPONS (Page 1 of 2), US Army TACOM-RI, 24 February 2006. Access Date: 8 January 2008. ↑ DiGiulian, Tony. USA 0.30 caliber (7.62 mm) Minigun. NavWeaps.com, 30 October 2006. Access Date: 3 April 2008. ↑ Parsch, Andreas. Designations Of U.S. Aeronautical and Support Equipment. Designation-Systems.net, 23 June 2006. Access Date: 3 April 2008. ↑ "Garwood Industries | M134G, Minigun, Helicopter Gatling Gun". Garwood Industries. M5 Systems. http://www.garwoodindustries.com. Retrieved 27 April 2013. ↑ Armament of the Georgian Army. ↑ "En Enero el Ejercito Mexicano recibira 400 full Kits M-134 minigun para Hummvees y Cheyenne". Todopormexico.foroactivo.com.mx. 2010-12-21. http://todopormexico.foroactivo.com.mx/t866-en-enero-el-ejercito-recibira-400-full-kits-m-134-minigun-para-hummvees-y-cheyenne#6070. Retrieved 2012-01-20. ↑ Hogg, Ian (1989). Jane's Infantry Weapons 1989–90, 15th Edition. Jane's Information Group. p. 351. ISBN 0-7106-0889-6. Ballad, Jack S. Development and Employment of Fixed-Wing Gunships, 1962–1972. Washington, DC: Office of Air Force History, United States Air Force, 1982. United States. Headquarters, Department of the Army. FM 1–40 Attack Helicopter Gunnery. Washington, DC: Headquarters, Department of the Army, 1969. Wikimedia Commons has media related to Minigun.